Our mission is to supply a sufficient supply of superior quality drinking water to the citizens of the Park Cities. This district consistently produces and delivers water of the highest quality as recognized by the Texas Commission on Environmental Quality. • 1938 – Dallas County Park Cities Water Control and Improvement District No. 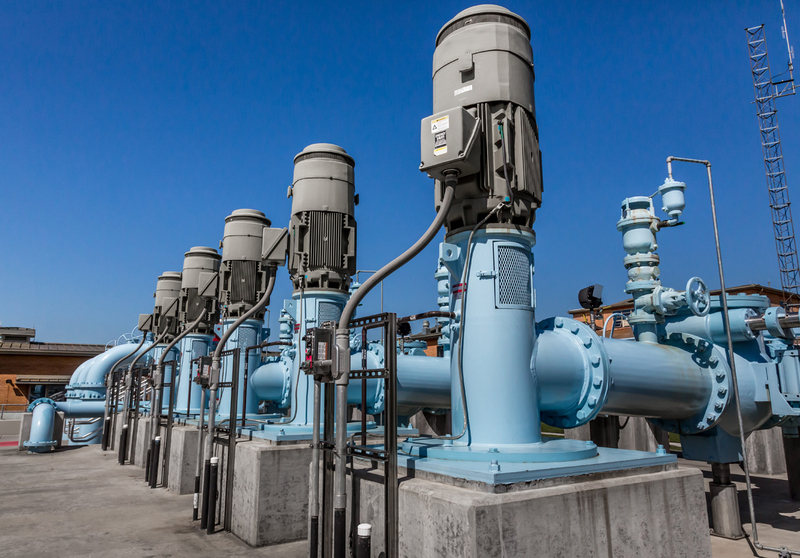 2 created by State of Texas at the request of the City of University Park and the Town of Highland Park to obtain a common and independent water supply. District is governed by a five member Board of Directors elected from the Town and the City. • 1946 – District obtained water rights for a reservoir on Denton Creek for 50,000 acre feet of water. • 1947 – District entered into agreement with U.S. Corps of Engineers for construction of a larger lake – Grapevine Lake – along with the City of Dallas, whose share would be 85,000 acre feet of water. The District’s share of the cost was $607,000. • 1950 – District water treatment plant completed and began operation utilizing raw water purchased from City of Dallas until Grapevine Lake could be completed. Cost of treatment facilities, transmission mains, and storage was $4,086,000. • 1952 – Grapevine Lake completed. • 1954 – District began taking water from Grapevine Lake. • 1973 – District converted from a Water Control and Improvement District No. 2 to a Municipal Utility District. • 1982 – District entered into a temporary emergency supply agreement with the City of Dallas to supply treated water to the Town and/or the City in cases of emergency. • 2004 – District engineering consultant conducted study for upgrading the treatment facilities to latest technology to meet proposed new Federal Regulations. Consultant recommended adding membrane filtration facilities. • 2005 – District committed to the Town and the City that it will also address elimination of taste and odor episodes in any new treatment facilities. • 2006 – District engineering consultant conducted pilot study on three micro/ultra membrane manufacturers’ filter units. • 2007 – Engineering consultant preliminary design study completed and approved by the State on the use of membrane filters to treat the District’s water. Also, recommended three options to address taste and odor issues. • 2009 – Design begun on membrane filter facilities and plant improvements. Construction Manager of Risk hired to manage project construction as well as be involved in design process. • 2010 – Sold $33 million of revenue bonds and start of construction. • 2013 – Project completed and operational. 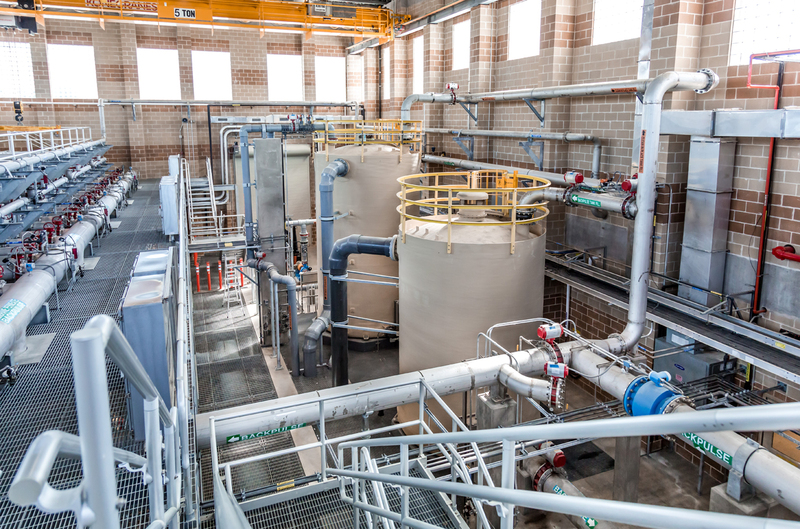 After completing a thorough analysis of the Park Cities water needs, including maintaining the exceptional standards residents experience today, the Dallas County/Park Cities Municipal Utilities District (MUD), concluded a State approved 12-month study to implement a membrane filtration system. 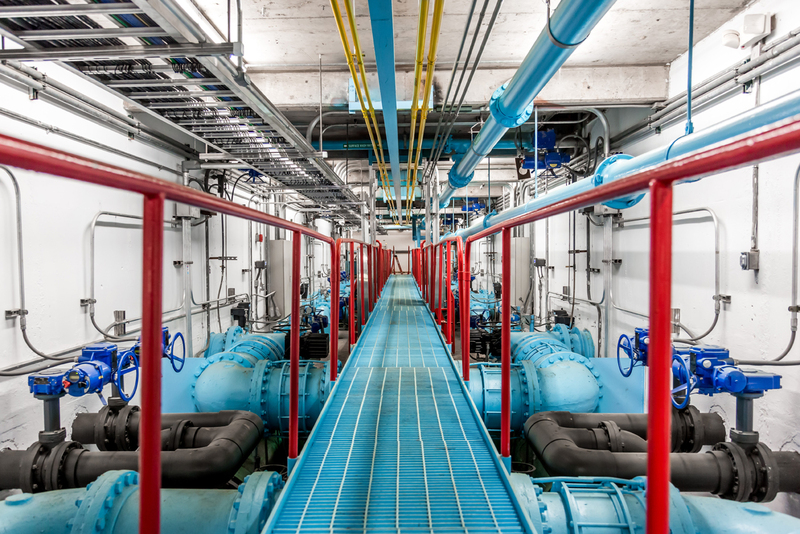 Currently, the water plant meets or exceeds all of the Environmental Protection Agency requirements and holds the highest quality rating by Texas Commission on Environmental Quality. Environmental concerns are often a popular topic in the media. Residents can rest assured the Park Cities MUD places public safety and providing the highest quality of water as its mission critical. A recent study conducted of emerging contaminants, concluded that the Park Cities MUD raw water source and treated water were below or non detectable by industry standards. The plant will continue its due diligence to be current on the issue and sustain its quality. 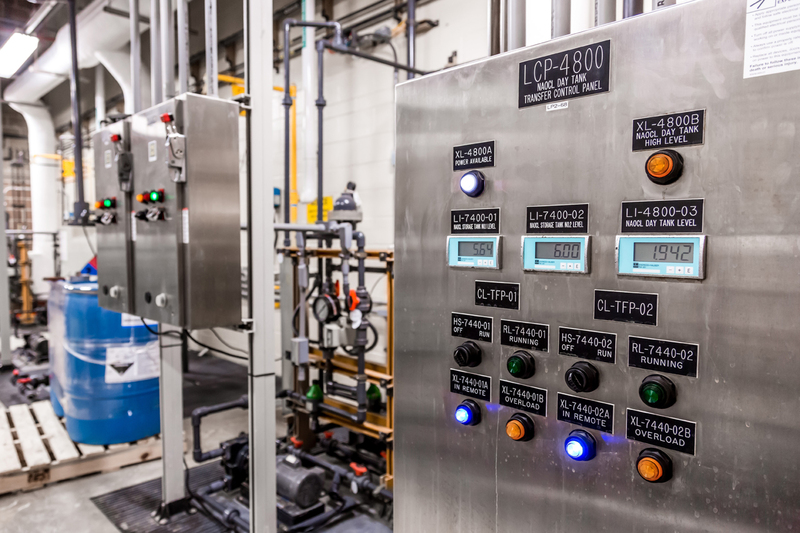 By upgrading the current facility to the state-of-the-art membrane filtration system, the plant continues to meet or exceed state and federal regulations while also delivering a “bottled water” quality product. In addition to the membrane filtration system, granular activated carbon filters were added to continuously control odor and taste that can sometimes be an issue in the warm Texas months. 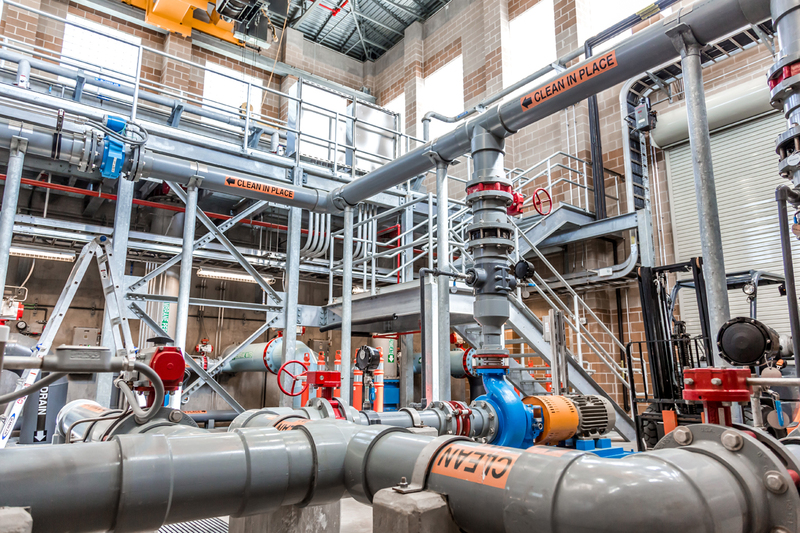 The District has completed of the construction of the membrane filtration system and plant improvements in 2013. To provide the funding for the improvements, the board elected to go to the open market for the sale of $33 million revenue bonds as it had the best interest rate of 3.6%. Repayment of these bonds will be done through the District’s revenues and not taxes. This project was the most substantial upgrade since the plant was opened in 1950. Studies indicate this important investment in the water infrastructure will allow Park Cities MUD to comply with anticipated stronger regulations for decades to come. Both the Town of Highland Park and the City of University Park actively participated in the process and welcome forward thinking and preparation to always improve service to their citizens. In addition to plant upgrades, Park Cities MUD put forth additional efforts to “go green” by participating in the Electric Reliability Council of Texas (ERCOT) through a partnership with EnerNOC to conserve electrical usage during potential “brown outs.” Often Texas summers require water restrictions and the Park Cities MUD keeps a careful watch on supply and demand to meet customer’s needs. The project was designed over 2 years by CDM Smith, Consulting Engineers. Construction on this project began in October 2010 completed in 2013. Archer Western Contractors, Inc. was the District’s Construction Manager at Risk on this project. As such, they contracted with the District for a “guaranteed maximum price not to exceed” of $33.7 million for this project. This gave the District assurance that this project would not exceed budget. The project came in under budget. About your H2O, did you know? At the District’s request, the Corps of Engineers releases water from Lake Grapevine Dam into Denton Creek. The water flows down Denton Creek and joins the Elm Fork of the Trinity River to flow into Ski Lake near Hwy. 114 and N.W. Highway. Water then flows down a pipeline to the District’s’ plant on Regal Row near Harry Hines Blvd. where it is screened and lifted (pumped) up the plant’s elevation. Lime slurry and ferric sulfate are added to the rapid mix. The rapid mixer provides mixing of these chemicals with the raw water, causing coagulation or clotting of impurities in the water. The water then goes to the flocculators, where the coagulation continues, creating a floc particle that becomes heavier than water. From the flocculators, the water enters clarifiers (settling tanks) where the floc settles out of the water. This settle floc or sludge is pumped out to the sludge lagoons for future disposal. The clarified water then is run through new granular activated carbon (GAC) filters to remove remaining particles as well as taste and odor problems. 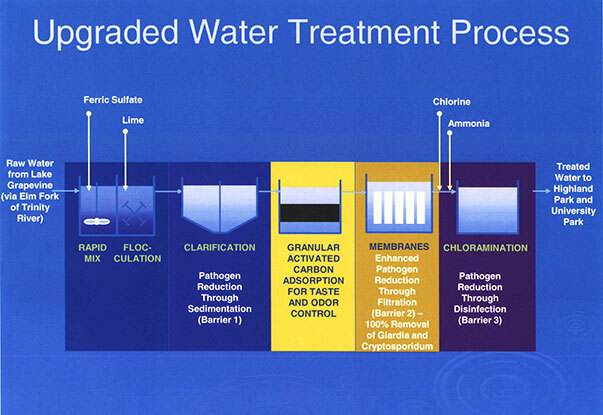 The filtered water is then disinfected via the addition of chlorine and ammonia, forming chloramine. Chloramines are used to cut down on the formation of trihalomethanes (THMs) or other disinfection byproducts caused by the addition of chlorine alone. This filtered water is then pumped to the District’s new ultra membrane filters for final filtration. These filters will filter out all particles 0.1 microns and larger. This provides a physical barrier to Cryptosporidium and Giardia cysts that can cause intestinal, digestive upsets. The filtered water is then sent to the District’s 10 million gallon underground clear well (storage tank), where the water is stored until pumped to the Town of Highland Park and the City of University Park as needed. Why don't we just buy Dallas water? Dallas water quality is excellent, and we use it when we need an emergency supply but our city fathers wanted us to have a separate water supply, independent of Dallas and others. What do I do if I see a leak? What do I do if the water smells funny? Contact us at main@parkcitieswater.com and give us your address and description of the taste/odor problem. Typically, each year the District will experience an episode of taste/odor in its raw water due to lake turnover or an algae bloom. During such events, the District, once the event is recognized, will add powdered activated carbon to our treatment process. This additive will absorb the taste/order chemicals in the water, thus removing or reducing the problem. These episodes usually only last a few days. What do I do if the sewer backs up? Our water comes from a surface water source as opposed to wells. It comes from Grapevine Lake via the Elm Fork of the Trinity River. It is treated at the District’s treatment facilities located at 1811 Regal Row. Treated water is then transmitted to the town and the city through a 36″ main in Denton Drive and Mockingbird Lane. The District performs a minimum of 7,150 tests per month on water quality. 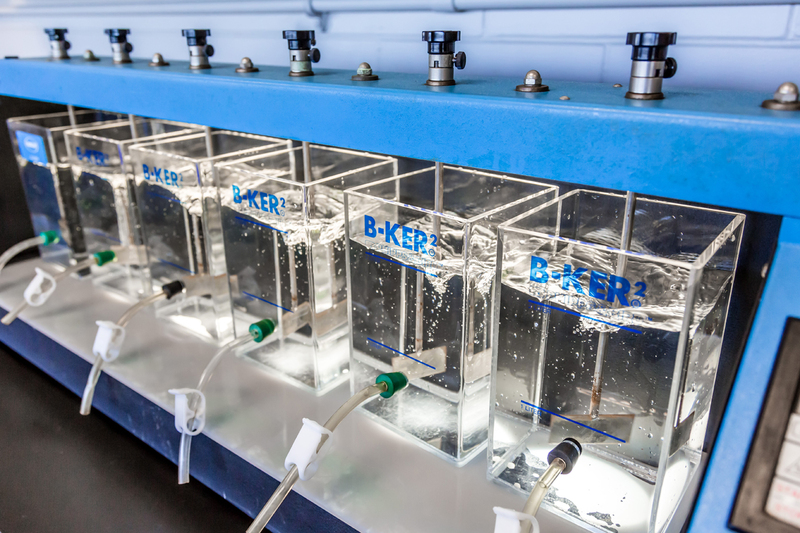 Parameters regularly tested during and after treatment include water temperature, turbidity, alkalinity, pH, hardness, chlorides, chloramine disinfectant level or residual, and presence or absence of coliform bacteria. Water temperature, tested at start of treatment, affects the reaction efficiency for particle removal and disinfection. Turbidity is a direct measure of water clarity and reflects the effectiveness of the particle removal processes. Testing is done before treatment, after coagulation and flocculation, after sedimentation, after filtration, and as treated water leaves the plant. Alkalinity and pH are important factors in the coagulation reaction and pH is important during disinfection, therefore these values are measured throughout the process. Water hardness is measured to assess the lime softening process. Chlorides are monitored in raw and treated water to forewarn of any upstream contamination and allow for appropriate treatment adjustment. Disinfectant residuals are monitored to insure adequate levels are maintained after disinfection, after filtration, and as treated water leaves the plant and out in the distribution system. Presence of coliform bacteria in water supplies indicates possible microbiological contamination. For this reason, bacteriological tests are performed on water before, during, and after treatments, and at designated locations in the distribution system. 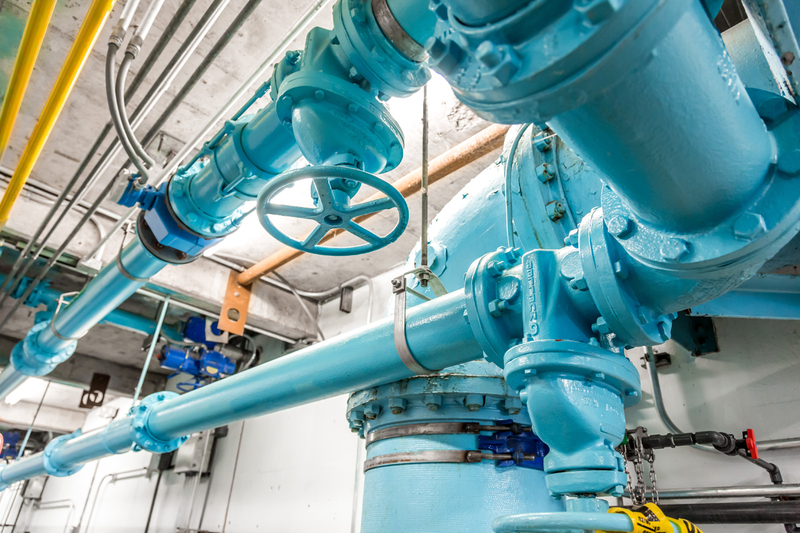 Monitoring and testing for organic, metallic, and radioactive contaminants are performed by the TCEQ (Texas Commission on Environmental Quality) on water entering the distribution system. Of the 97 tests required by the EPA, all constituents detected are well below regulatory limits. Reduce your outdoor watering to once every 5 days. This encourages deeper, more drought-tolerant roots. And remember if it rains more than 1 inch, wait at least 5 days to water. If your sprinkler sprays a fine mist, you’re losing a lot of water to evaporation. Try a different sprinkler head or better yet choose a drip system. Mulch, mulch, mulch! This simple step captures and retains soil moisture beautifully so that your landscape can withstand the Texas heat. Cover pools and spas when not in use to lessen evaporation. A typical Texas summer can cause a water loss of almost 1,800 gallons a month. Most showers pour out between 5 and 10 gallons per minute. Time yourself when your under the spray. And choose a low-flow showerhead that saves about one-half of the amount of water you’re currently use while still providing a refreshing, cleansing shower. Using about 12 gallons per run, automatic dishwashers claim the most water in the kitchen so make sure they’re full before you turn them on. Same holds true for washing machines which use more than 40 gallons a load. One little leak can add up to 15-20 gallons of wasted water a day. Check all faucets at least once or twice a year.